Maruti Suzuki India Limited, the country’s largest car manufacturer hasn’t looked back since the launch of the Swift hatchback in India. 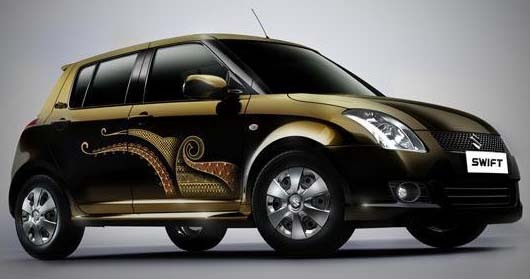 The Maruti Suzuki Swift is a global platform which was launched world wide in 2005. From the time the Swift was launched, it was a runaway success with waiting periods extending anywhere between 6-8 months.Now, to commemorate the success of the Swift hatchback, Maruti Suzuki India Limited have launched the Limited Edition Swift. It is called the “Swift One Million Edition”. It will sport a unique if what slightly garish ‘Goldsmith Black’ paint job and a set of equally devilish body graphics. The car would be available only in the Vxi version of the Maruti Suzuki Swift Petrol. It will also have different floor and cushion mats, leather seats and an entirely different USB-plug in audio system. All this is been done to distinguish it from the truck loads of Swifts roaming in the country. Apart from that, it would also sport the Swift One Million Edition tag on the tail of the car. This celebration edition in addition to the festive ocassion also shows the fact that Maruti Suzuki have sold one million cars in a year and out of the extensive small car portfolio that Maruti Suzuki India Limited possess, the Maruti Suzuki Swift was the millionth car to roll out from its Manesar plant. No changes to the power train would be done, as we would have expected and only 1,000 of this limited edition versions would be produced. The Swift One Million Edition is to be sold only in the petrol Vxi guise and it is pegged at a price of Rs. 483,079 (ex-showroom, Delhi).